NVB Tracker Pro 2x24 Night Vision Binoculars observe the night in a new fashion as you try out Yukon Advanced Optics' new night vision binoculars. 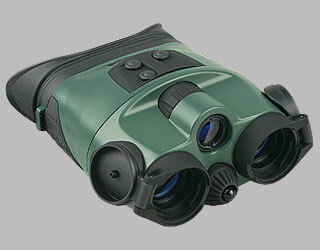 The Tracker line of night vision binoculars is compact, lightweight and provides a wide field of view. The water resistant body increases the binoculars' versatility, while the central focus knob and fixed eye span distance provide comfort and reliability. The soft, one-piece eyecup prevents external light distortion and light leakage from the device, allowing the user to remain hidden in the night. Tracker binoculars utilize built-in PULSE™ system illuminators for enhanced image clarity in total darkness. Dual IR unit of NVB Tracker Pro 2x24 optimizes the observation process by night. The main IR illuminator enables concentrated vision at a distance of up to 150 m. The auxiliary wide-angle IR illuminator provides excellent panoramic picture at short range of up to 30 m.